The Wild Country Rock Lite is a comfortable lightweight EPS/Polycarb helmet. It features four headtorch attachment points and an adjustable EVA cushioned Coolmax lining to keep your head cool whilst climbing in hot temperatures. At a quoted weight of 260g it is not the lightest in its class; the Petzl Meteor III + is 235g and the Black Diamond Tracer is 245g. 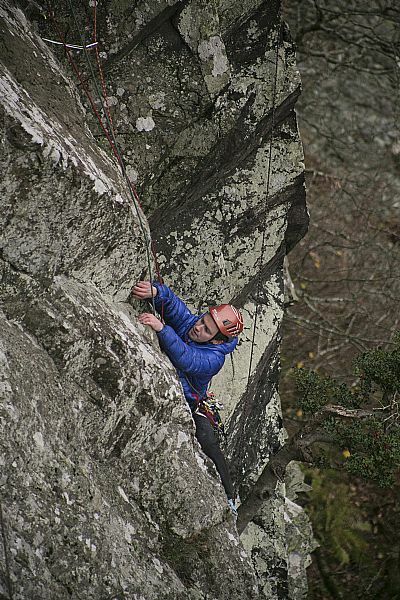 However, the Wild Country Rock Lite still represents a weight saving over more traditional ‘hard shell’ helmets such as the Petzl Elios (330g), Black Diamond Half Dome (340g) and Wild Country’s own 360 helmet (360g). As we see more design innovations and developments, such as the Petzl Sirocco (165g), at 260g it may no longer be considered such a lightweight helmet. Moving on from its weight, the Wild Country Rock Lite Helmet differentiates itself from the Petzl Meteor III + by utilising a ‘Quick-Dial’ adjustment system similar to the Black Diamond Tracer. This allows single handed adjustment of the head circumference whilst wearing gloves. For many people this will be an irrelevance, but for those intending on using it in colder temperatures it does make adjustments easier. Continuing its ease of adjustment it also uses a 16mm nylon chin strap. Whilst seemingly innocuous this allows the chin strap to be tensioned far more easily; something cheaper/older helmet designs often fail to consider. As mentioned above, the Wild Country Rock Lite features an adjustable EVA cushioned Coolmax lining intended to keep your head cool whilst climbing in hot temperatures. Whilst the Coolmax certainly does aid cooling and wicking, there is so much lining that it actually provides insulation. Compare this with the minimal less absorbent lining on the Black Diamond Tracer. Whilst it may only be personal preference it is worth factoring in to your decision. Something which afflicts almost all EPS/Polycarb helmets is the relative ease with which damage can occur. In contrast to more traditional ‘hard shell’ helmets an EPS/Polycarb helmet will damage with alarming ease. This vulnerability to damage will mean those with a propensity for not looking after their gear should be more cautious and should be a consideration when deciding which helmet to take. An important caveat that should be noted is that head shapes and sizes are massively diverse and much like footwear it is highly recommended that you try several helmets on to get the best fit. Lightweight at 260g quoted weight. Easy adjustment 16mm nylon chin strap and quick release chin strap buckle. Price; at £65 RRP it is comparatively cheap to many other EPS/Polycarb helmets. Not the lightest in its category. Absorbent lining is too thick and insulates head rather than allowing good airflow. The Wild Country Rock Lite Helmet is an excellent introduction to the ‘foam’ helmet category at a price that should make it even more appealing. 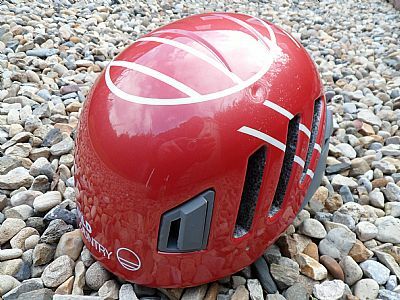 But for those seeking outright weight saving there are now several helmets available in the sub 250g weight range or for those seeking less vulnerability to damage a traditional ‘hard shell’ may still be a better choice.